Caesium manages to compress images without it hardly being perceptible in their quality. There are many times when it can come in very handy for us to be able to compress photographs or images so as to occupy less space: whether to send photographs by email, to manage to make our website take less to load, to upload photographs to our social networks, or simply, to store images on our hard drive without taking up so much space. 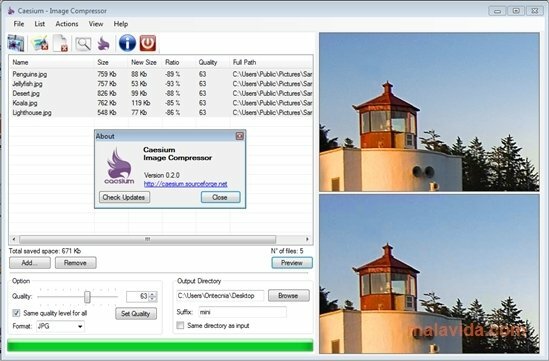 Caesium is a simple tool with which we will be able to reduce the size of the images without losing quality. At first glance it will seem as if they have the same quality, but one of them will occupy a lot less space. This is accomplished by means of a simple process: first we choose the images that we want to compress, the output format, that can be either JPG, PNG or BMP, the output quality and last of all, the destination folder. And thanks to the preview window we will be able to check the result before compressing the photographs. 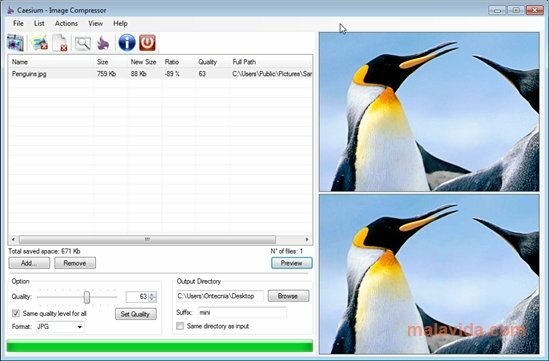 With these simple steps, Caesium will create compressed copies of the images, reducing their size. This download requires .NET Framework 2.0.